William Donovan Ard was born March 12, 1959 in East Orange and grew up in Watchung. A big, intelligent kid, Billy was already pushing six feet when he enrolled at Watchung Hills Regional in the mid-1970s. He played football and basketball for the Warriors, earning a scholarship to Wake Forest. The Ards were diehard Giants fans; Billy’s dad was a season ticket holder. Billy was offered a scholarship by Wake Forest and played four seasons for the Demon Deacons. Wake was horrible at first, winning just 2 games in 1977 and 1978. However, under coach John Mackovic, the Deacs turned things around in 1979 and went 8–4, scoring upsets over nationally ranked UNC and Auburn. Billy didn’t think too seriously about the possibility of playing pro ball until the end of his junior year, when his linemate, Syd Kitson, was taken in the third round of the 1980 draft. One year later, Billy was selected by the Giants with their 8th-round pick. His dad was at the draft holding up a sign that read “Make Ard Your Guard” whenever New York picked. Taking advantage of an injury, he slipped into the starting lineup late in the season and was part of the Giants’ first playoff team in more than 15 years. In 1986, New York’s offense caught up to its defense and the Giants put together a championship season. 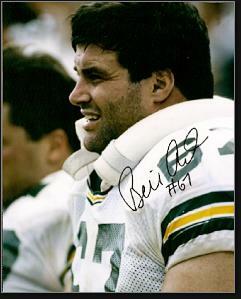 Billy, Brad Benson, Bart Oates and Karl Nelson anchored one of the most formidable offensive lines in history. From the end of October to the Super Bowl win over the Broncos in January, they dominated week in and week out. In 1987, Billy had another good year and was picked as a Pro Bowl alternate. 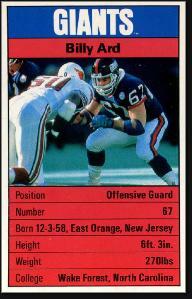 Billy held the starting left guard job through the 1988 season, after which the Giants left him unprotected when Plan B free agency started. They gambled that he would not want to leave New Jersey…and lost. He turned down offers from the 49ers and Chiefs to sign with the Packers. He got a bump in salary, and played his final three NFL seasons in Green Bay. After football, Billy continued a career in financial services that he had begun during his NFL off-seasons. He moved his family back to Watchung, where one of his sons, Brendan, became a two-time state wrestling champion. He also coached the freshman football squad at his old school.